Marc Brown has been employed by University of Iowa Facilities Management for 50 years. During that time, he helped introduce HVAC and lighting automation to campus, resulting in significant cost savings. Photo by Tim Schoon. The next time you’re inside a campus building and you notice the temperature is at just the right setting, think of Marc Brown. Brown, a controls engineer in Facilities Management, began working at the University of Iowa in 1967 when he was in high school. Since that time—save for a brief stint in the military—Brown has worked for UI and has had a positive impact across campus and on the university’s bottom line. Brown helped shepherd the UI into a modern age of heating, ventilation, and air conditioning automation and energy conservation. “Marc was an early adopter and pioneer of building automation systems that help us maintain better comfort control in our buildings while maintaining energy efficiency,” says Katie Rossman, manager of data analytics and commissioning in Facilities Management. Brown’s projects don’t just make the campus look brighter, however. They also come with energy savings and rebates from MidAmerican Energy Co. Rossman says that since 2012, Brown has been involved with nearly 200 lighting projects on campus, ranging from small retrofits to major lighting fixture and control upgrades. His roughly 10,000 hours of work on those projects have contributed to almost $600,000 in annual savings for the university and more than $1 million in rebates from MidAmerican Energy. This money is then reinvested in further energy conservation and lighting upgrade projects across campus. An Iowa City native, Brown began working at the UI as a high school senior through City High School’s trade and industries program, which allowed him to work as a student helper on the university’s campus while earning high school credit. Brown says he originally planned to follow in his father’s footsteps as an auto mechanic, but a different opportunity awaited. Brown continued as a student helper until he graduated in 1968. He stayed on as a temporary employee and was hired as a full-time electrician in October 1968. About seven years ago, Marc Brown assisted with a large-scale, 6,000-fixture lighting project in the Main Library. This project led to more lighting automation across campus, as well as converting campus from fluorescent bulbs to LEDs. Photo by Tim Schoon. At the time, the Facilities Management teams worked differently than they do now, Brown says. Brown was drafted into the U.S. Army in September 1969 during the Vietnam War, but stayed stateside and worked as a company clerk. He was discharged in 1971 and immediately returned to campus. After his return, Brown says Facilities Management began the shift from construction work to maintenance. In the late 1970s, another facilities group was created that piqued his interest—energy conservation. “They needed somebody to go out and install and work on these HVAC automation systems, which was completely new,” he says. Brown says he retrofitted numerous campus buildings with automated HVAC systems, including the English-Philosophy Building; the original Voxman Music Building; and the Clapp Recital Hall buildings, Lindquist Center, and Seamans Center. “The University of Iowa was probably ahead of the curve on most universities in doing that,” Brown says of the energy conservation efforts. Brown continued with energy conservation and was part of a group that maintained the HVAC systems across campus, which is no small effort. “We have tens of thousands of little processors sitting all over campus that control your temperature, humidity, and pressure in your building,” he says. About seven years ago, Brown was presented with a new challenge: assisting with a large-scale, 6,000-fixture lighting project in the Main Library. Fortunately, lighting automation and HVAC automation share some similarities, Brown says. 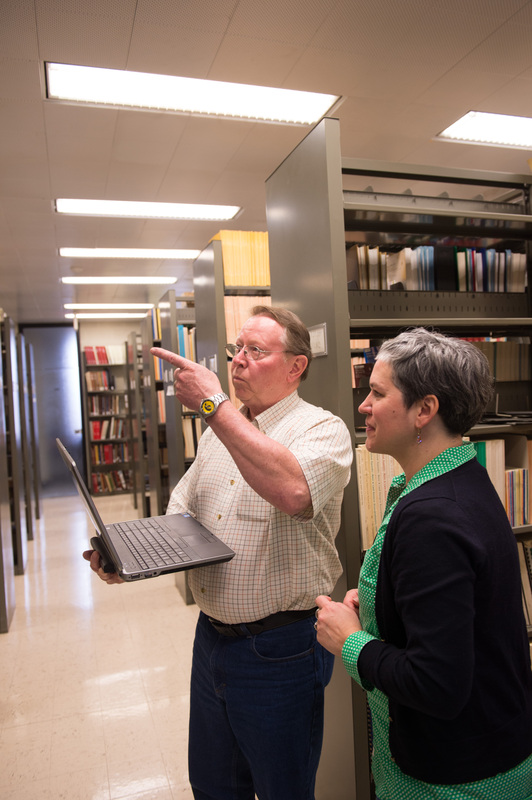 The Main Library project was the beginning of a new phase in Brown’s career, which led to more lighting automation across campus, as well as converting campus from fluorescent bulbs to LEDs. Far more complicated than simply screwing in a light bulb, Brown’s projects had to take into consideration brightness, light quality, dimming, and harvesting natural light. “There were some strategies to implement,” he says. Among Brown’s favorite campus projects were two at the Field House in the last five years, in which the old lights were upgraded to fluorescent lighting and later upgraded to high-efficiency LED lighting. New lighting was installed in the gym, corridors, running track, and athletic offices. Lou Galante, associate director of Facilities Management Projects, says Brown has been a leader throughout his time on campus. Brown says he doesn’t have a plan to retire and will continue taking work one day at a time. After 50 years on campus, he says he still finds the work interesting, challenging, and enjoyable.